There were so many ways to say it, but the only thing that mattered was that they were fools. Alchemy was already a misunderstood art to begin with, but, to be turned away from her associates, from her home....dimwits. Mara stands outside the gates of her birthplace, Skjellafoss, a district on the Eastern edge of the world. Even from this distance, she can hear the roaring of the powerful waterfalls the city is built on, can still see the houses that are connected by rickety footbridges. The magic users of Skjellafoss believe that living dangerously amongst the falls is the key to unlocking their potential. Alchemists are especially in tune with nature, respecting the checks and balances that allow mere humans to manipulate matter. 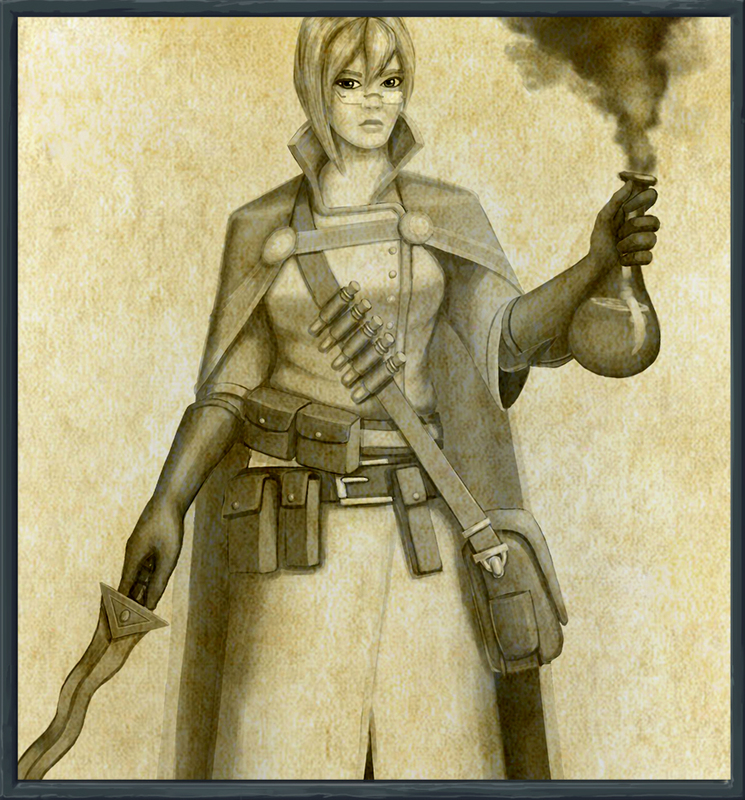 Mara was one of Skjellafoss's leading researchers until it was discovered that she was experimenting with forbidden black arts. She was searching for a way to revive a skeletal dragon, said to be the sister of Drake. This kind of disturbance of the life chain is prohibited in Skjellafoss, and the leader was not interested in hearing how Mara had planned to use the dragon to help protect the town. She watches the rushing waters of the falls, taking one last look at the place that betrayed her. Mara had always been accused of being cold, distant, emotionless. She's never felt that charge ringing as true as it does now. She feels nothing but disdain. She scowls, hitching up her single pack of supplies she was allowed to bring with her. Smoke pours out of her lab, her "taboo" research being lit aflame. She turns and leaves without looking back. At the bottom of Skjellafoss's powerful waterfall, a young Hunter sees smoke twisting towards the moon. 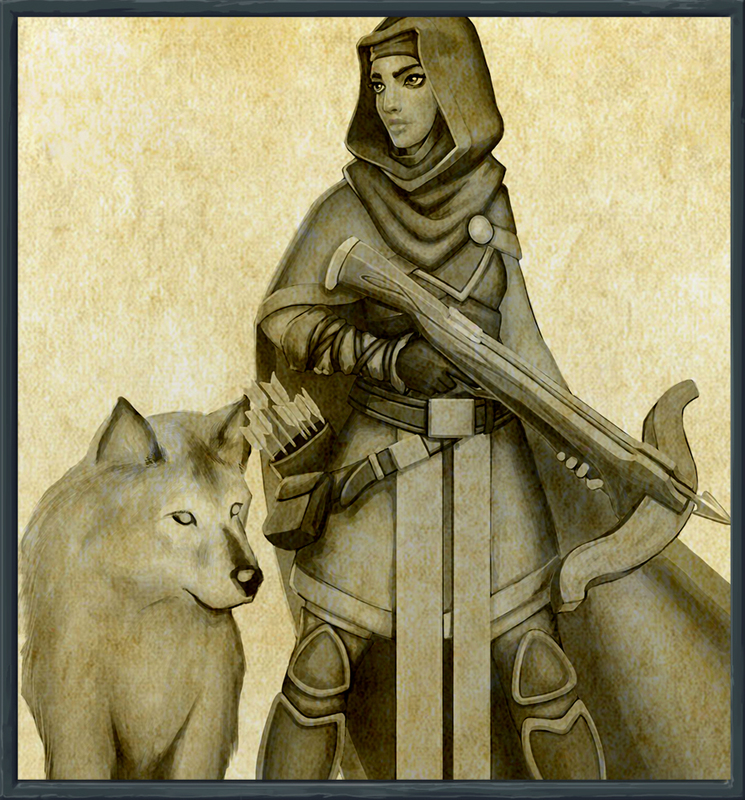 You recognize Farah, and her emerald-eyed wolf companion, Aera. Farah has been travelling for a few months now, with nothing but some simple supplies and a message she suddenly received from a Mother she thought to be long since passed. The tattered note simply says "Find The Guild." Drifting from city to city, Farah's expert combo of survival skills and repartee have earned her what little information people have to offer about The Guild. For such a large organization, it’s shrouded in mystery. Her days have been filled with following vague information and the occasional false lead. Farah doesn't let it bring down her spirit, though, smiling cordially at anyone she meets, seeing each dead end in her journey as a learning experience. She pulls out a well worn map, crossing off a few more towns that had little information to offer. Farah has worked her way from the South to the East, and the further she goes, the more leads she receives. It seems to be the right direction, and at least the skies are clear enough tonight that she can see the stars. She starts a fire, and makes camp near the base of the waterfall, Aera curling up beside her. Farah smiles as she scratches her wolf friend's ears. She wonders what kind of places she’ll be led to tomorrow. Throughout her journey, she’s been delayed at various villages in need. She’s taught farmers a more suitable and effective way to plant their crops to maximize their harvests. She’s passed what few coins she keeps accumulated to the sick and poor. She’s treated injured animals in the forests, and injured children in the towns. The work is often thankless, despite the lengths she goes to, but it never matters. She’s always said that positive change starts with a single stepping stone, and does what she can to help people in need. “Do good for others”, it’s a moral that she values more than anything. It reminds her of her mother, what little she can remember. It had been so many years, the image of her had started to blur around the edges, like viewing a photo beneath the current of the river. The picture was there, but the vivid color had begun to muddy, the fine details lost to the sands of time. Quest: Take the Key of Dreams to a hard (• • •) dungeon. At the start of each floor, spend 6 time. When victorious, proceed to the next chapter.